BOSTON – Thursday, July 27, 2017 – Mayor Martin J. Walsh, the Mayor’s Office for Immigrant Advancement and the Mayor’s Mural Crew this summer will partner together to paint a set of murals as part of Boston’s “To Immigrants With Love” public art campaign. The murals will be located in East Boston and Roslindale, and will celebrate immigrants’ contributions to Boston and their local communities, featuring past and present immigrants in each neighborhood. In addition to highlighting the economic and cultural vibrancy immigrants bring to their neighborhoods, “To Immigrants With Love” also connects immigrants to City services and resources via a campaign website. The East Boston mural will be located on the Paris Street side of Dr. Dental (55 Meridian Street) and will feature immigrants Carmello Scire and Veronica Robles. Scire immigrated from Sicily in the early 1930s and founded his own catering business. Currently run by Scire’s grandson Steve Scire, Sammy Carlo’s Delicatessen and Catering continues Scire’s dedication to community service and has been located in East Boston for over 75 years. Beside the portrait of Scire will be one of Veronica Robles. Robles is a cultural ambassador, educator and longtime community activist, who immigrated from Mexico in 2000. 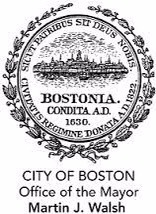 Mayor Martin J. Walsh appointed Robles to serve on the leadership council for Boston Creates, the cultural plan for the City. The Roslindale mural will feature immigrant business owners Alex Castillo and Louis and Beatrice White. The mural will be located at Atlas Wine and Liquors (591 Hyde Park Avenue), which was founded by the White family. After immigrating from Russia in the early 1900s, Louis White opened a local supermarket in 1933, which eventually transitioned into the Roslindale liquor store. The business is now run by White’s grandson Jeff Fine. Castillo, originally from the Dominican Republic, immigrated to the United States in January of 1996 and now owns Digitech Electronic Solutions in Roslindale. The “To Immigrants With Love” public art campaign was sponsored by the Mayor’s Office for Immigrant Advancement (MOIA), Mayor’s Office of Neighborhood Services (ONS), the Mayor’s Office of Arts and Culture via the Mayor’s Mural Crew, Mayor’s Office of New Urban Mechanics, and Boston Main Streets. An unveiling ceremony is planned to be held upon completion of the murals. This local initiative was inspired by the national “To Immigrants With Love” letter-writing campaign led by Define American and I Am An Immigrant. Celebrating and humanizing past and present immigrant contributions to the City of Boston through community-inspired art, the campaign also connects the immigrant community to city services and resources through digital outreach. “Now more than ever, we’re proud to support the ‘To Immigrants With Love’ campaign to declare that we proudly stand with immigrant communities in Boston and across the country,” said Todd Schulte, President of FWD.us, the primary organization supporting the I Am An Immigrant campaign. The Mayor’s Mural Crew, a youth employment program that transforms overlooked areas in the city into vibrant cultural landmarks, is painting the murals. Led by artist Heidi Schork for the past 26 years, the Mayor’s Mural Crew has long served as a way for youth to engage with their own community, as well as develop professional skills. The Mayor’s Office for Immigrant Advancement works to ensure the full participation of immigrants within the civic, economic, social and cultural life of Boston. Every year, MOIA assists over 2,000 residents by connecting them to English language classes, helping them obtain citizenship application assistance, facilitating access to city services, and providing accurate information about immigration laws, which helps immigrants contribute socially and economically to the city. For more information go to: http://www.boston.gov/immigrants or call 617-635-2980.